Some changes to new developments. The City has started rolling out some changes to the planning process which were announced a few months ago. One of these changes are new signs and an attempt at using plain language in development applications to make them a bit easier to understand. Another is a pilot project which will be starting up later this month to allow our Heron Park Community Association to be engaged much earlier in the planning process. 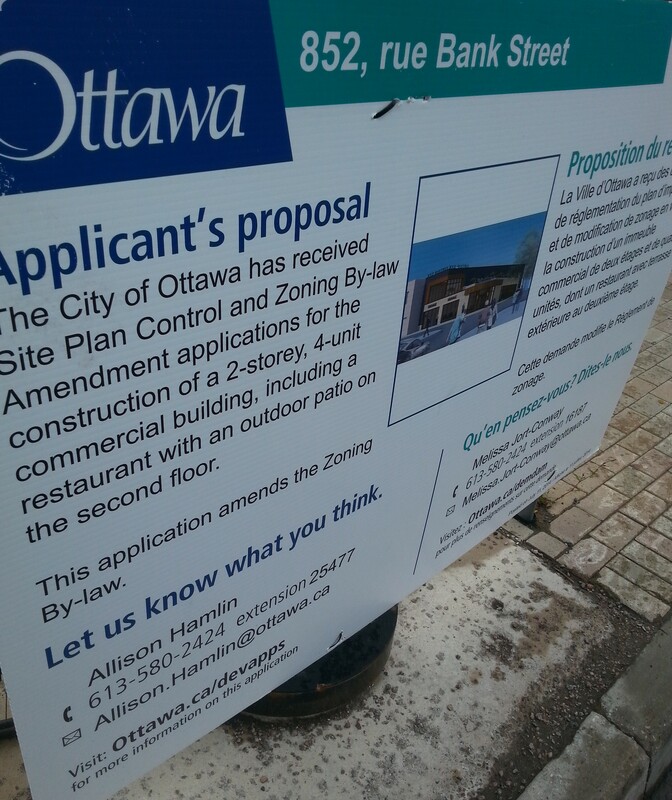 Currently our community is given a “Head’s Up” around the same time that the public signage goes up, which is always after the applicant has submitted a full, completed application to the City (with all the required plans, fees and studies). The pool staff at the Heron Park Wading Pool is teaming up with the Heron Park Community Association to organize a party in Heron Park on Wednesday, August 1 from 11:00 a.m. to 5:00 p.m. The theme this year is HAWAIIAN LUAU! There will be a costume contest, decorations, themed activities (throughout the day), and the usual special event treats (slip’n’slide, parachute, music, etc.). The HPCA will fire up a couple of gas grills around noon and we will be selling $2 all-beef hotdogs and $3 hamburgers. Drinks will be $1 each. Jumbo Freezies for $1. So, bring your grass skirts and colourful shirts to Heron Park on August 1st!!! 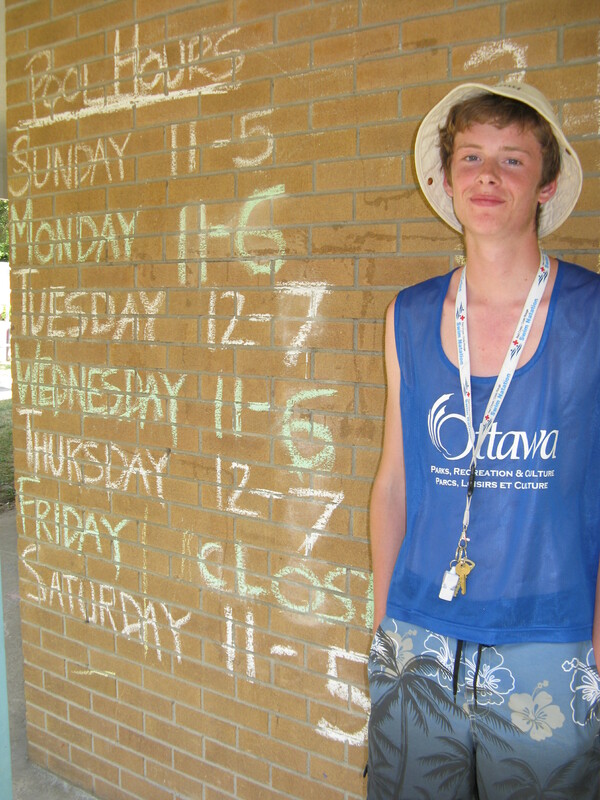 Curtis poses in front of Wading Pool schedule. The Heron Park Wading Pool is once again open for the season. With all the hot, dry weather we’ve been experiencing in Ottawa this summer, residents are very grateful that they have a place to bring their kids to cool off and have fun. 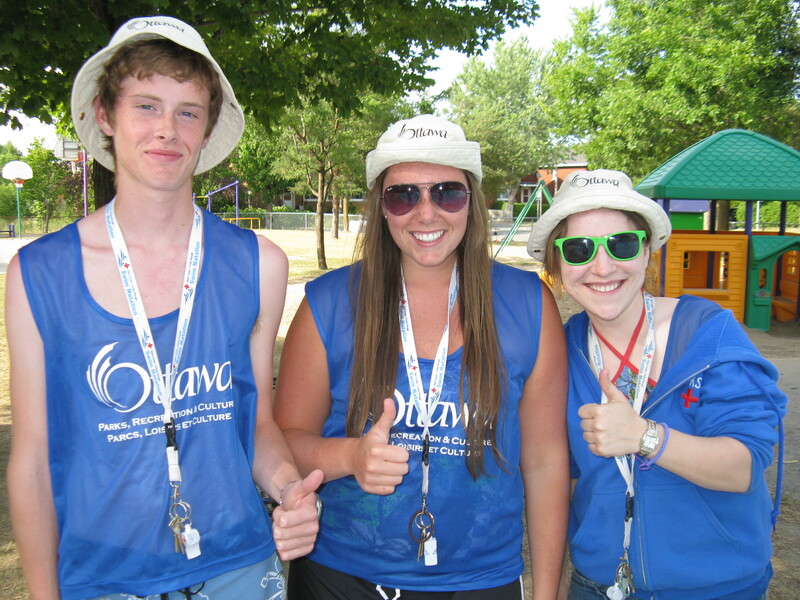 Steph, Curtis and Chris are lifeguards with the City of Ottawa who have been assigned to the Heron Park Wading Pool. Curtis, Heather and Steph are City of Ottawa lifeguards for the Heron Park Wading Pool. Steph is the Wading Pool Supervisor. Community Design Plan – A Fit for Heron Park? The City of Ottawa’s recent Open House on the community design plan for Bank Street between Billings Bridge and Heron can be accessed at the link below which goes directly to the information shared at that time. Please scroll down to the bottom of the page to click on links to the presentation materials. If you seek more information, please post a comment or question on this site and a response will be provided as time permits. Breaking News: Pedestrian Bridge over Brookfield O-Train tracks! The City of Ottawa’s Transit Commission approved moving forward on Thursday, June 16th to make major improvements to the existing O-Train line. 6 new trains are to be purchased, the existing 3 trains will be sold and the tracks will be doubled in the vicinity of Gladstone and Brookfield. This will improve service from the current 15 minutes to 8 minutes. Doubling the track at Brookfield includes a much desired pedestrian bridge over the tracks. The goal of the study is to prepare a CDP for the portion of Bank Street mentioned above. The plan will provide a broad and integrated twenty-year vision and guide for the future of the area. Visit www.ottawa.ca/bank for full details. Opening Day for Wading Pool! The wading pool is a wonderful, well-used community resource. Enjoy! Michaela and her cousins Viviane, Coby and Kevin enjoy opening day of the Heron Park Wading Pool. Non-profit community organizations in Ottawa are invited to submit applications for new projects that address Community Project Funding priorities. Eligible organizations can apply for two different streams of funding namely, One-Year Project Funding and Three-Year Project Funding. Increase neighbourhood capacity to enact positive and sustainable change in planning, service delivery, improve health and/or improve safety in accordance with neighbourhood-defined goals. Promote the healthy development of children and youth (0-18 years) and their development of competencies through recreation, leisure, cultural and arts activities. Increase participation of seniors in physical activities and community life to promote successful aging. Support inclusion of people who are low income, at risk, isolated or otherwise marginalized and promote quality of life for the full diversity of residents through activities such as literacy, employment, physical activity and/or participation in cultural programs. Promote conditions of equality on the basis of race, ethnicity, income, gender, official language and ability. Application deadline: Thursday, April 8, 2010. If you require special needs accommodation for the information sessions, please contact Julie Tremblay at 613-580-2424, ext. 12513. For more information on the 2010 Non-Renewable Community Project Funding Program, please contact Rahmat Shahidi at 613-580-2424, ext. 24251. The City of Ottawa’s 13th annual 55 + Short Story Contest invites submissions of original, unpublished short stories or memoirs of 2000 words or less by Ottawa residents 55 years or older. Eight entrants will be named to the 2010 Winners Circle, sharing recognition and prize money of $400. They will be recognized at An Afternoon of Readings on Wednesday April 28, 2010 from 1 to 4 p.m. at the Heron Seniors’ Centre, 1480 Heron Road. One of the winning stories will be selected for publication in the spring issue of Forever Young newspaper. Though contestants may submit multiple entries, they will only be eligible to win one prize. An entry fee of $5 per story is applicable. Deadline for submissions is Monday, March 15, 2010. This contest is co-sponsored by the Colonel By Retirement Residence and the Forever Young newspaper. Ottawa – Les résidents de 55 ans et plus sont invités à soumettre des mémoires ou des nouvelles originales non publiées de 2 000 mots ou moins dans le cadre du 13e concours annuel de nouvelles « 55 Plus » de la Ville d’Ottawa. Huit finalistes seront nommés au Cercle des gagnants de 2010, partageant reconnaissance et des prix en argent de 400 $. Ils seront reconnus lors d’Un après-midi de lecture qui aura lieu le mercredi 28 avril 2010 de 13 h à 16 h au Centre des aînés Heron, 1480, chemin Heron. Un des récits gagnants sera sélectionné pour publication dans la revue Forever Young du printemps. Bien que les candidats puissent soumettre plusieurs nouvelles, ils ne sont admissibles qu’à un seul prix. Des droits d’inscription de 5 $ par nouvelle sont exigés et la date limite des soumissions est fixée au 15 mars 2010. Le concours est commandité par la Colonel By Retirement Residence et la revue Forever Young. Afin d’obtenir tous les détails concernant le concours, veuillez prendre une brochure dans un des centres du service à la clientèle ou appeler le Centre des aînés Heron au 613-247-4808, poste 1.